Ask about our True Lifetime Warranty! Northern Maryland Water Specialists are your authorized RainSoft dealers serving Harford County, Cecil County, and surrounding areas in northern Maryland! Over the years, RainSoft has developed a reputation as the industry leader for water treatment systems systems for your home or business. As your local RainSoft dealer, RainSoft air purification and water treatment systems improve the Quality of Life for our customers and their families by offering them environmentally responsible air purification and water treatment for their homes. Not sure if you need a water treatment system? We offer free water quality testing so you can see exactly what is in your water, and how it is affecting the taste, smell or causing stains. STOP IN AND VIEW OUR COMPLETE LINE OF WATER TREATMENT SYSTEMS! that provide crystal clear, superior quality drinking water and water for cooking...without the plastic bottle. These systems are eco-friendly and conveniently located at your kitchen sink. RainSoft drinking water systems offer you bottled water quality drinking water, no matter what the original water tastes like, These drinking water systems include the Ultrefinder reverse osmosis system and the Hydrefiner water filtration system. , also known as water conditioning systems or water conditioner systems, save money and energy by reducing water, soap and detergent consumption. Water-using appliances last longer with RainSoft water softening systems; and bathing and showering has never felt better! The RainSoft name is synonymous with water softener, because we’ve been providing water softeners to homes and businesses since 1953. We offer whole house water treatment solutions to solve any number of water quality problems. After water quality testing determines what the issues are with your water, we will recommend a water treatment system that we can install and maintain as long as you live in your home. for the entire house, not just one room. RainSoft air purification products help you breathe easier and provide peace of mind...silently and out of sight. If you or a member of your family suffers from allergies, asthma or another respiratory illness, an air purification system can help remove contaminants that could affect your health. Installed in the air duct work of your home, the Airmaster Ultra uses UV purification and ozone purification to kill air contaminants that were too small (such as bacteria and mold) to be caught in your HVAC system air filter. With the purchase of any of our drinking water, water treatment systems we offer 12 months same as cash! When combining chlorine with organic materials in the water, it creates a volatile organic compound which is associated with a 21% higher risk of bladder cancer and a 38% higher risk of rectal cancer. The term "hard water" refers to the mineral deposits of calcium and magnesium which are dissolved in water. These minerals can cause numerous problems, including plugged pipes, ruined faucets and hot water tanks, soap scum buildup on shower curtains or shower doors, as well as dry skin. Sulfur can cause major problems for anything metal in your house, including copper plumbing, electrical wiring, faucets, refrigerator condensers, silverware, and other metal items. 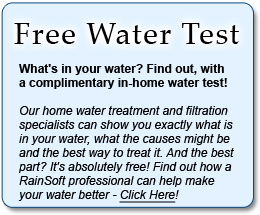 RainSoft Water System Filter & Water Softener will eliminate the sulfur in your water. Iron can stain appliances, bathtubs, showers, washing machines, dishwashers, laundry, and fixtures. A home water treatment system can remove the iron from your water to eliminate staining. It has been more than 60 years since the first RainSoft water conditioner was sold from a small garage just outside of Chicago, Illinois. Since that day, RainSoft has become an industry leader in water treatment, drinking water filtering and water softening for homes and businesses throughout the world. RainSoft has been dedicated to producing "The World's Finest Water Treatment" and superior customer service since the beginning. We also ensure that all of our air and water conditioning products meet customer expectations and demands from R&D through installation and service. RainSoft continually strives to produce the world's finest water treatment available on the market. With water treatment and air purification products ranging from small, portable water treatment systems for homes and apartments, to larger treatment systems for factories, hotels and hospitals, we have water treatment solutions for every location. Click here to schedule maintenance for your water treatment system or air filtering system-- enjoy the comfort of having clean air and water. 1-800-242-2049 or click here to email us so we will help you with your lead remediation! Whether you want us to remove lead from your water, setup a whole house water treatment system, install or service a drinking water system or just come out for a free water quality test, just call 800-242-2049. We are authorized RainSoft dealers for all of Harford and Cecil Counties, including Bell Air, Fallston, Forest Hill, Aberdeen, Edgewood, Elkton and Northeast. With better quality water you can see, taste and feel; the quality difference is clear. For questions regarding RainSoft's drinking water systems, water filtration solutions, or air filtration products, contact us at 1-800-242-2049. 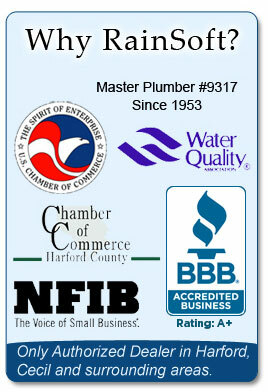 Forest Hill, Aberdeen, Abingdon, Belcamp, Churchville, Edgewood, Fallston and surrounding areas.